See also Boosey & Hawkes Australia Pty. Ltd. when credited that way. 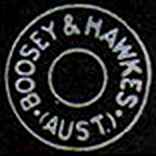 Boosey & Hawkes Australia Pty. Ltd.